The cards in your sideboard are pretty much unplayable due to their high mana cost. 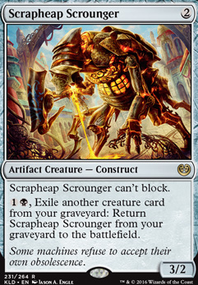 Get some cheap enchantment removal in there like Fragmentize , if you don't have that then you just instantly lose to cards like Leyline of Sanctity . Squirrelbacon I made the change between Faithless Looting and Fiery Temper with Lava Spike and Light Up the Stage and it was really good advice. 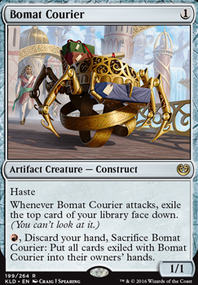 I tried Bomat Courier but I find myself every time in the situation where I have good cards in the hand and so I left in exile the cards under Bomat. It was a little frustrating so I stop playing it. But I'm open to suggestion on how to play bomat better. 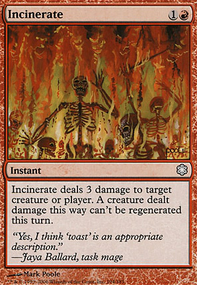 Some effects cause permanents to be exiled face-down. These items are hidden, unless an instruction specifically says that you can look at them. For example, Bomat Courier says you exile the top card of your library face down, but does not say anyone may look at that card. As the reminder text on that ability states, that means you cannot look at it (nor can anyone else). There are two things that are important here: (1) Each player can look at the cards they exiled, but (2) they cannot look at the cards others exiled. Ok so my question relates to any effect that causes a card to be "face down" in an otherwise public zones e.g. 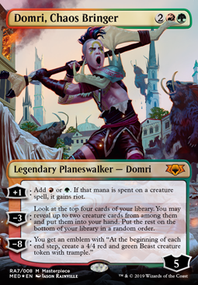 Gonti, Lord of Luxury , Thief of Sanity , Bomat Courier or any manifest. Say I was playing against UB at the protour and got royally mana screwed game 1. Nothing really happened in the entire game except I played an Island and he plays a Thief of Sanity hitting me once before i concede. Say the thief hits me and sees 2 islands and a Root Snare and he exiles the fog and puts the islands in my bin. 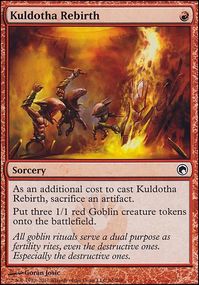 Taking into account the competitive setting am I allowed to look at the exiled card before shuffling it into my deck seeing as it could give me vital information as to whether my opponent knows about what I'm playing for game two? Also is this the same for other similar effects I mentioned? P.S. 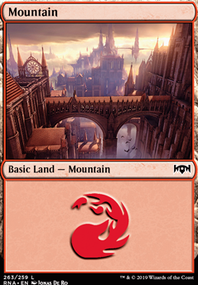 I am aware that morphed creatures need to be revealed between rounds.